Pumpkins and cauldrons at the ready, it’s Halloween! This year we’re getting involved in Penistone Round Table & Penistone Ladies Circle’s spooktacular family event, and you should too! 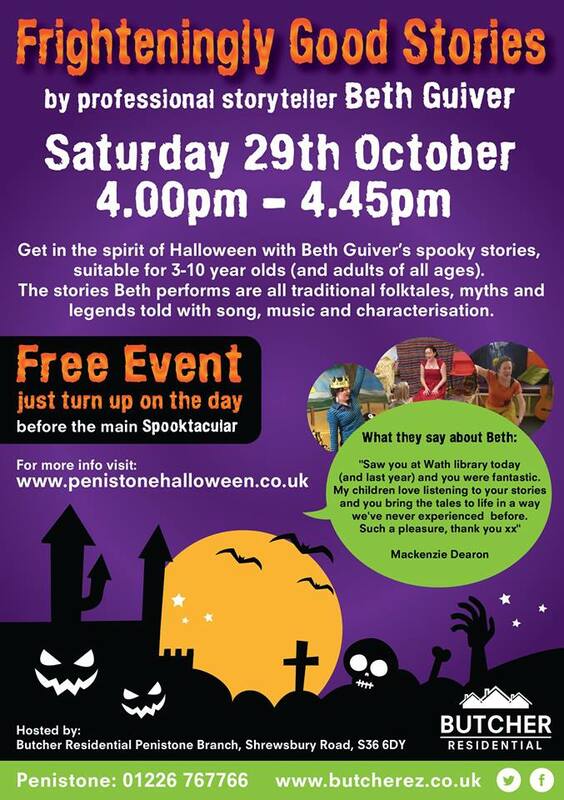 Before the main event in the Market Barn, storyteller Beth Guiver will coming to our Penistone office (just across the road), to tell some fantastically frightening children’s Halloween tales. Gathered in a cosy corner, Beth performs her stories using song, music and characterisation. She encourages the children to get involved too, doing actions and singing along with her. The stories aren’t too scary, being adapted for 3-10 year olds (and adults of all ages)! it’s the perfect way to get everyone in the Halloween spirit. The story telling will begin at 4pm and will last around half an hour, giving you plenty of time to wander over to the next set of spooky events on offer! Don’t forget your fancy dress and carved pumpkin for the pumpkin competition!